My mate Steve just got married to a stunning young lady. Which surprised us all really. Steve is about as Australian a bloke as you could find in many ways. He's bluff, charming, rude and funny. He's from an Italian family and that part of him is just as prevelant. An encyclopedic knowledge of Australian wine, an accompanying generosity to share it with everyone that boggles the mind and a love of good food. I like to think of Steve as my Australian double in some ways. We look nothing alike, I don't have an encyclopedic knowledge of British wine (if such a thing would even warrant an encyclopdia is questionable), he's much taller than me but stick us in a kitchen together and we are the same. 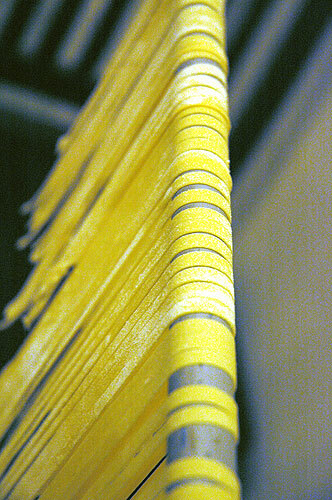 We methodically spent an evening making fettucine from scratch, leaving the yellow floury strands to dry on a broomstick suspended between two chairs. Despite the fact we were born some 16,000 miles apart, we both responded to the soft strands of pasta in our hands at a cellular level, something deep in the DNA made us do it. He'll probably say I was being a bit wet writing like this but he know's its true. Good luck mate. Lovely, Monkey. Just noticed the new banner, too. I'm going to have to get your advice on that. I've an Australian mate too - who stereotypically drinks beer, farts and swears a lot. He cooks a great BBQ though!